To make your home decor complete, you need to take care of many insignificant details. Clothes hangers might seem unimportant, but in reality, they are not. If they do not match with your overall decor scheme, they might ruin it altogether. Here are some of the most aesthetically appealing clothes hanger that might complete your decor. No time to organize your clothes neatly in closet? Well then indeed this ‘Touch Me’ hanger comes in great use. The stylish and space saving hanger is crafted in the shape of a human hand that grasps hanging clothes without letting them fall easily. The three hands with white framework are sturdy enough to bear the weight of your heaviest coats. It can be easily assembled into a wall and will preserve the shape of all your delicate clothes hanging on it. Mounting this ‘touch me’ hanger at your homes’ entrance will not only give a nice appeal to your interiors but will also serve as a place to hang on the drenched clothes in the rainy season. To keep your clothes wrinkle free, one of the simplest and quickest way is to use hangers or hooks. Specifically Hangers keep our attire in an organized manner. 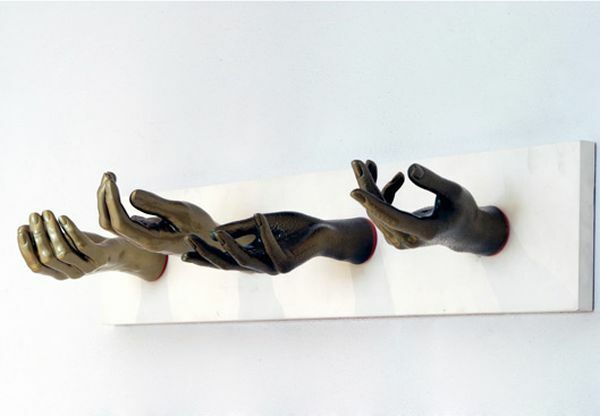 Following are some new concepts of coat hanger that will add novelty in your collection. Clothes hangers can be boring but designer Jinhong Lin via has created something unique that will give some newness to your home. He has made the use of Bamboo that is a fast growing plant and is very sustainable. The bamboo stalk is taken and the outer green layer is stripped down. Then the shaved bamboo is left out in the sun for drying it to a brown color. The brown bamboo stalk is turned into an elegant looking coat hanger. This is purely an environment friendly method. Designer Boyeon Oh has gone completely simple with his coat hanger design. 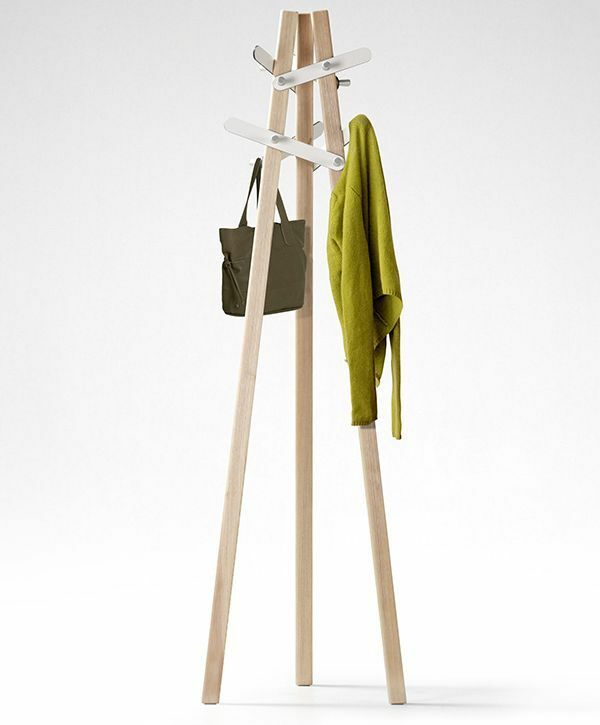 Six Leaf is a coat stand that is easy to produce and anyone can assemble it without using any tools. The triangular construction gives the stand a strong base. It has twelve pins and six hooks that give the user to hang many clothes on it. The hanger is semi-finished that gives the user an opportunity to add their own style to it. Talented designer Jaehyung Hong inspired by ordinary regular pins created an extraordinary coat hanger. You can very easily clip your clothes or coats in it. Paper clip coat hanger assures that your clothes does not fall and are in proper condition. Simple Coat Hangers are an innovative creation of Swedish designer J Lindvall for de Nord. 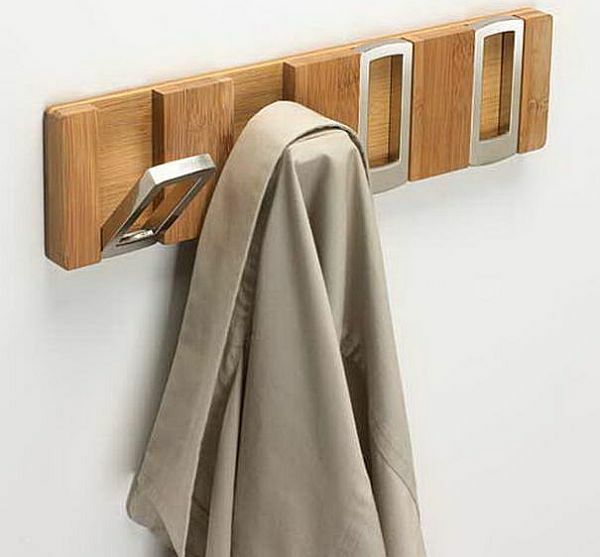 Wood is used to give the hanger a strong base and different hooks are applied for hanging numerous clothes or coats. Simple coat hanger is mounted on the wall that gives your house an elegant and simple look. 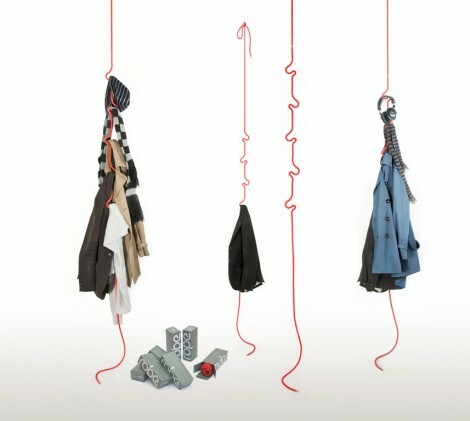 Designer Ingibjorg Hanna has created a creative coat hanger that is totally opposite from mundane coat hangers. 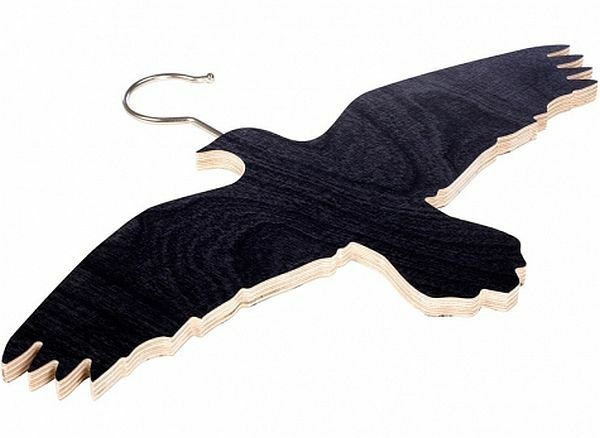 A wooden bird is used as a hanger for your coats that gives a unique touch to your cupboard. If you’re the kind of person who cannot be bothered to hang his clothes up on hangers and stash then in closets, then the RobeRope Hanger by Jan-Patric Butcher and Justus Kraenzle is something you should definitely invest in. The designer duo from the German label Club Cocage describe their unique creation as being a “storage accessory” though it can also be used to serve as a functional sculpture or a minimalist coat hanger that can be installed near a home’s entrance. Hung from a hangman knot, the hanger is divided into hanging sections that are geometrically spaced and shaped to resemble hooks. The hanger is made out of marine rope and comes with a special inflexible design that allows it to retain its shape even when heavy garments like winter coats are hung from it. The entire hanger measures four meters in length and can be suspended from ceilings to provide users with a long, vertical storage space for hanging their common wearables within easy reach. The RobeRope can also be used as vertical, exposed clotheslines which can be used by users to air dry their garments. Sadly, as appealing as the design is, it cannot lay any claim to bring 100 percent original. The design derives its form from the “Mess Hanging System” created by Luis Eslava in 2004 and the “Les Danseuses” rope hanger/hooks created by Atelier Oï. Designed by Dan Henriksson, the multifunctional wall hook looks stylish and serves its purpose well. 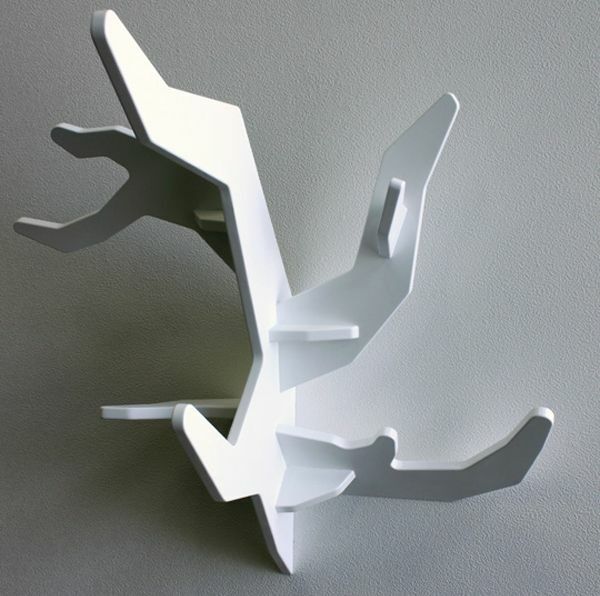 Resembling a snow-covered tree, the wall hook has several hooks and tiny shelves where you can store essentials like iPods and key chains. The “Snow Drop” offers you a simple and yet, stylish clothes hanger that would make eyes pop for sure. Designed by Julian Appelius, this coat hanger would be just perfect for the artist in you. 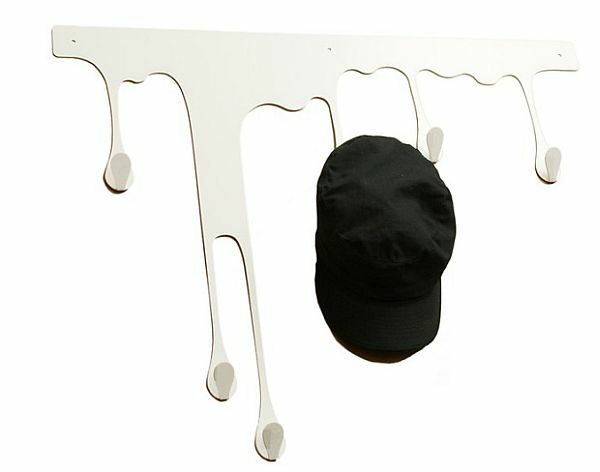 The hanger resembles dripping paint and comes in six different colors as well as two different sizes. Putting these hangers on your walls would amaze everyone how you managed to transform a bad paint job into a functional décor item. Designed by Luca Nichetto, these wall hooks would be perfect for hanging your clothes and storing essential items like keys and loose change. Made of ceramic, these hook boxes are the ultimate storage and organization option that every homeowner looks for. 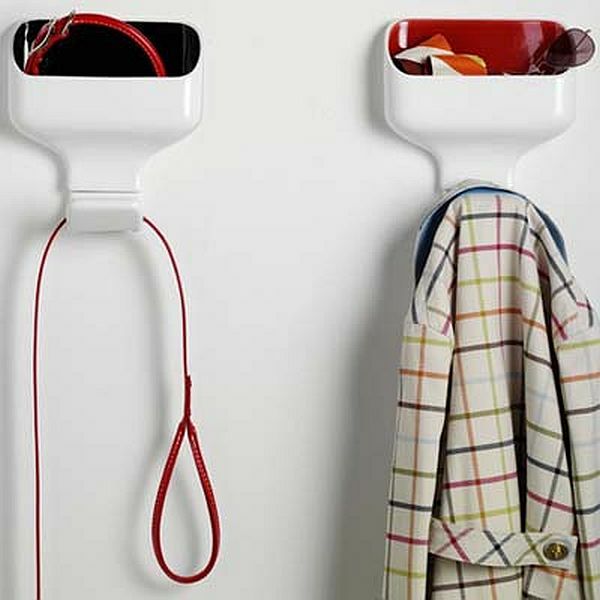 The Cubby Coat Hook by Materious comes with an outer surface where you can hang your scarves, coats, belts and purses. It also has an inner surface to store wallets, sunglasses, keys, gloves, etc. They come in different colors and can be attached anywhere on the wall, thus allowing you to be creative with the design. Designed by Matt Carr, the Hookaboo is a functional wall hanger that you can fold when not in use, thereby avoiding injuries that occur when you accidentally bump into wall hooks in the dark. 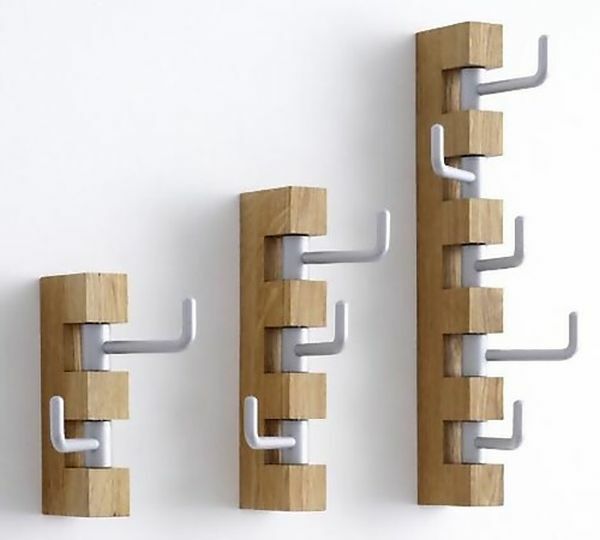 Made of bamboo, the wall hook has four protruding metal hangers, which you can collapse into the hook after use. The Hook Anemone wall hanger by Anders Ljunberg takes its design from underwater life and looks like an anemone. 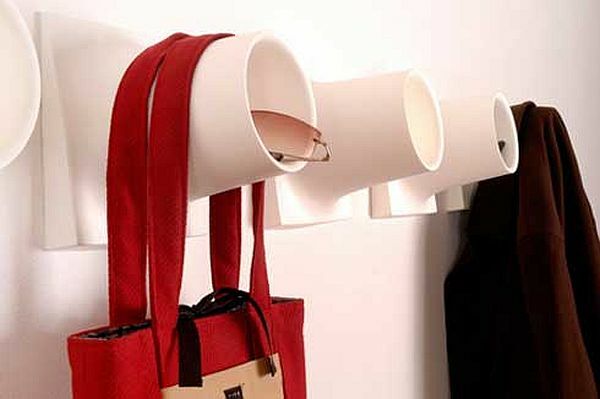 It can act as the perfect place to hang your clothes as well as accessories like rings, bangles, bracelets, chains and what not! It is still in the prototype stage though. The coat stands and unique hangers will catch all the attention from your visitors. 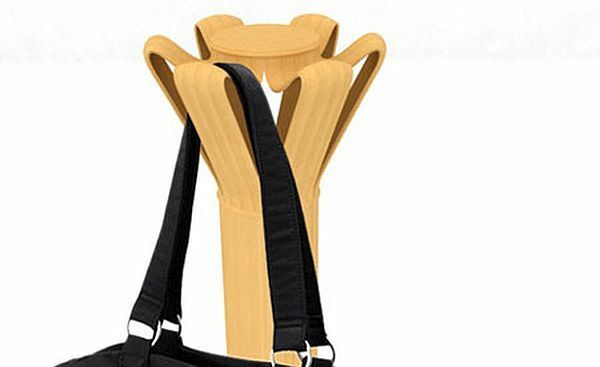 Now your coat hangers or stands will lighten your mood with their creative style.